Open up any authoring tool (okay, most of them) and one item that you will see is the ability to add PowerPoint. Some products including Articulate Studio and Storyline use the Microsoft SDK PowerPoint ribbon as their main ribbon. Use products such as Adobe Presenter or iSpring Presenter and in just a few short seconds you will be in PowerPoint and you can start building courses. If I was Microsoft, I would say to myself, “Why let these products be the only ones who can do this, when it is our product”. And lo and behold, Microsoft jumped into the fray. If you do not have PowerPoint 2013, sorry you are out of luck. On the plus side if you have it, it will work with both 32 bit and PPT 2013 and 64 bit and PPT 2013. An add-in, which only takes 30 seconds or so (depending on your cpu) to install. Where do you find in PowerPoint? To end the recording you have to use a hot-keys of CTRL+Shift+F12. Here is an idea how about putting a button the recorder that is a stop button. 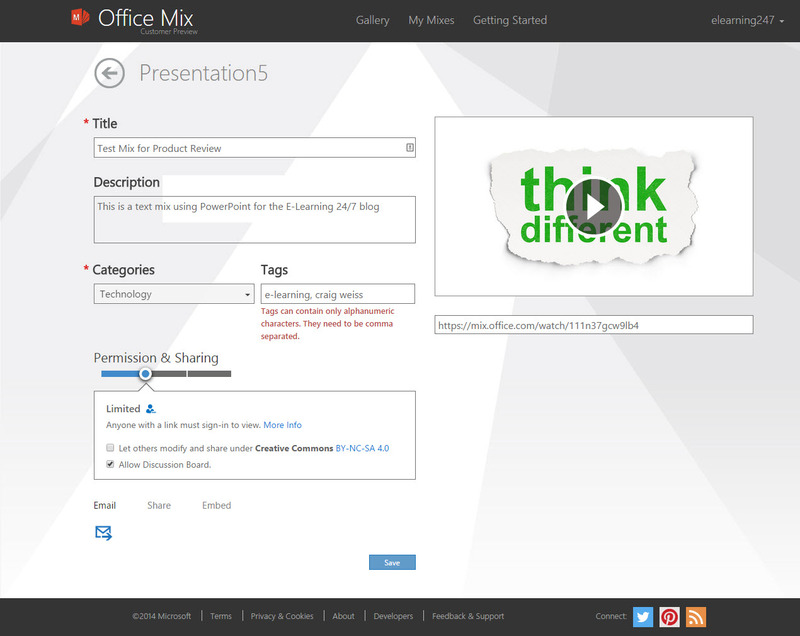 If you use one of the OfficeMix apps it shows that “This OfficeMix app has been developed by Microsoft. Microsoft Terms. Privacy and Cookies”. Not a fan of that. I mean who wants to see that in their presentation? On other slides you see “terms and privacy/cookies”. Right now you have apps for LiveApps under supposedly video, that is mostly targeting education. Screen Recording – Capture a screen. Initially it will go to whatever screen is below PowerPoint, but if you have multiple screens, you just move over to that screen and start a capture and record. As noted above to stop it you have to use hotkeys. Screenshot – Click and select any one of your open windows. It immediately places it into the slide. You then can move it around, shrink, etc. Personally, I think it is a great feature. Preview – Preview your mix. You can also preview while you are in the editing mode on the slide itself. 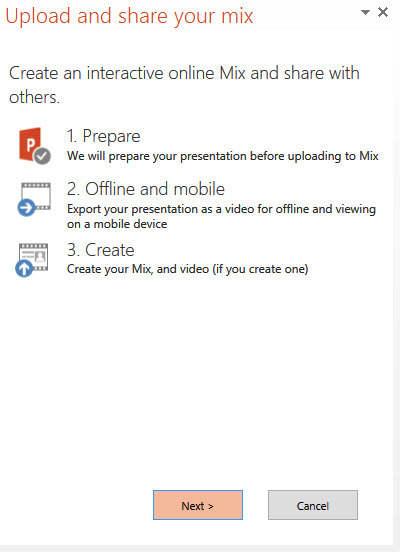 Getting Started Templates – There weren’t any pre-built templates with Mix that I saw, but the Getting Started is shown in PowerPoint as slides and really well done. Covers each item including screen shots and steps. To create a quiz is really rather simple. Click on the Quizzes/Video apps and you a window pops up. If you already have some apps they will appear first. If not, it is a blank screen with tabs including one that says Store. If you already have apps, the tab still says Store. As you notice is says Quizzes and Polls. I used the Multiple Choice Quiz and it immediately went into the slide I was viewing. With the quiz now added, I have several options including the ability to change the font size. You write in your own title, then select the choices, enter in the choice and then you have options including “Delete”, “Leave Comments” and select which check is the right answer. Green is the right answer. In my example, I left feedback for those folks who selected “No”. As noted earlier you can preview this question. Once you click preview, you can either accept it or click “Edit” to edit the quiz. On the Video apps, you have nine apps (I surmise more will come). 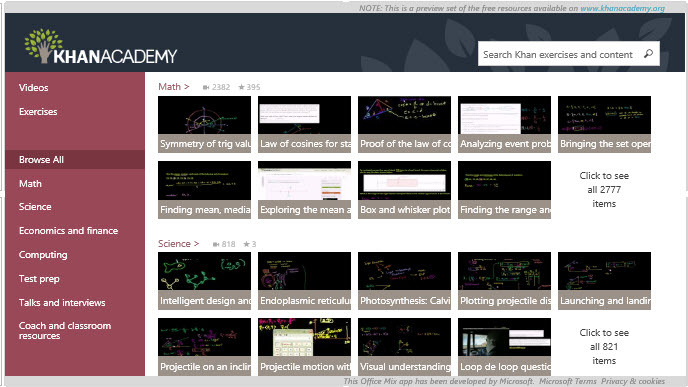 For me, I selected the Khan Academy app, which immediately placed the entire Khan video screen into my slide. I merely had to scroll down and pick the video I wanted to embed. Once I clicked it, it now was embed into my slide. Afterward, I added a screen recording and then a screenshot and saved. Now, I was ready to upload my mix to the cloud. When you click “Next”, a new window appears welcoming you to Office Mix and asks how you want to log in. Rather than forcing me to use a Microsoft account, it displayed other choices including organizational account, Google+ and Facebook. I really liked that. I wish they added Linkedin, which would then allow folks who do not want to use Slideshare as their sharing slide option. Oh on a side note, if you have any issues with slide mix before you even get to the log in screen, Mix will identify those errors, explain them and ask you want you want to do. Another nice plus. I logged in using my Google+ account and got ready to upload. 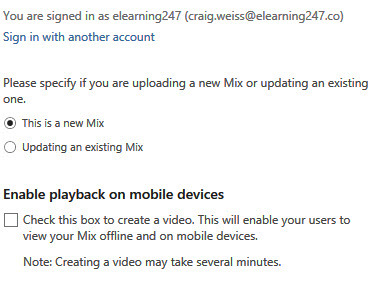 I stated that is was a new mix and then checked off the box enabling playback on a mobile device and allowing people to view the video offline. My test presentation was only 31 seconds so creating the video was rather fast. Seemed simple enough, but what I did find was a cumbersome step if I wanted to go back and create a new mix, using the scenario of myself signing in with another account. I actually used Google+ again, and it showed up in my window, but did not auto fill my password. Some people will like this as an added security, but for me, I wish it auto saved the password, eliminating me having to retype it in. As you can see e-learning 24/7 is listed as the account name. You can create your own account name prior to this screen, otherwise it will use your name as the default account name. Below your slide screen you will see a https:// link – this is the link to share with others and by doing so you can now track who views it along with some additional analytics. As you can see you can also allow folks to modify the mix under Creative Commons and also allow a discussion board. The above appears for each slide that you have, providing some details beyond just the main mix. 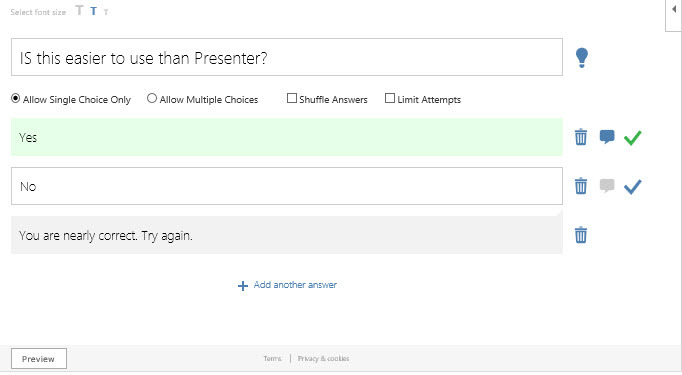 If you have a quiz additional options include % correct, avg. number of attempts, average hints used. Shows a pie graph identifying the percentage of completed along with a summary of presentation including number of apps used, number of quizzes used and number of videos used. And yes, you can view individual stats. No SCORM. So if you see the ability to push this out as a SCORM course you are out of luck. Best bet? Export as a video and add to your course or just add as a video. Overall, I give it a solid as in average. First attempt is nice, but this is Microsoft after all, and thus they should have had a tad more with its debut add-in. With a few tweaks and enhancements this could eventually knock Presenter from Adobe and iSpring Presenter out of fee based products. Add even more bits and pieces and you can have Studio in your sights. But until then, I’ll take what they can offer and move forward with that. Just promise me Microsoft that you continue to make Mix free. In my expereince Microsoft launches with products which are underwhelming then continually makes revisions and upgrades until they have a top product, Internet Explorer for example launched underwhelming, and today is a very popular browser, (though some would say it is still underwhelming). I am therefor not surprised to see their current version of Mix is not quite up to par. The question is whether Microsoft sees this only as an add-on to Office, and only provide minimal development, or if they see it as version 1.0 of a future full featured competitor to Studio. I suspect Microsft themselves see this as placing their toe in the water and are monitoring the market reaction to decide how much time and money they place into developing the product. If they continue development and add SCORM support, I would be concerned if I were Articulate. Whew. That post was a lot of work. Thanks. Making it free will guarantee plenty of uptake I suspect. RE SCORM, I suspect they didn’t want to have to wade into the SCORM / Experience (Tin Can) waters.